In the vibrant neighbourhood of Soweto that gave birth to the Freedom Charter, a small Afrikaans-speaking community prays, sings and struggles for survival. As she sang with the choir, tears began rolling down her cheeks. With eyes closed and hands gripping the bench in front of her, Sophie Weimers, head of the Griqua Independent Church in Kliptown sang. “And through his blood, his precious blood, I shall from sin be free!” The congregation of less than 30 people sounded graceful as they sang along with her on that windy Sunday morning. The church is situated between what is known as ‘Old Kliptown’ and ‘New Kliptown’, according to Weimers. Just down the road, is a street of shacks that shares its premises with the old houses. Up the road, are the new houses built in the 1980s. Upon walking into the church, greeted by big old wooden doors, the sound of the congregation is nothing less than heart-warming. The smell is old, like the dusty carpets beneath the worn-out wooden benches. However, the sound is spiritual. SANCTUARY: Pastor Victor Appels walks down the aisle inside Kliptown’s Griqua Independent Church. Coloured people make up 59% of Kliptown. I met Aunt Jeanette as I explored the township. 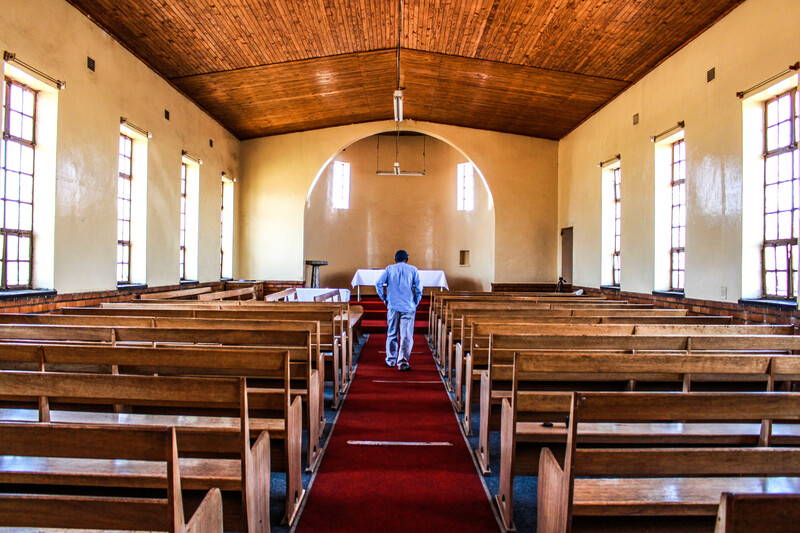 Down the main road, just a kilometre away from the popular Walter Sisulu Square where the Freedom Charter was adopted by the Congress of the People in 1955, I came across an old-looking church building that was surrounded by a rusted short fence. I was curious as to why there was no name for the church on display. On the right of the building was an old house with a red polished veranda that shared its premises with the church. I knocked on the old wooden red door, and waited a while before hearing someone shouting from inside: “Ek kom, wag ’n bietjie!”, meaning she would be at the door in a minute. She emerged from the front door just a few minutes later, a small-built woman, with hair as red as the sand that surrounded the premises, and an orange polo neck sweater that almost consumed her face. “The church has been around for almost 100 years now. 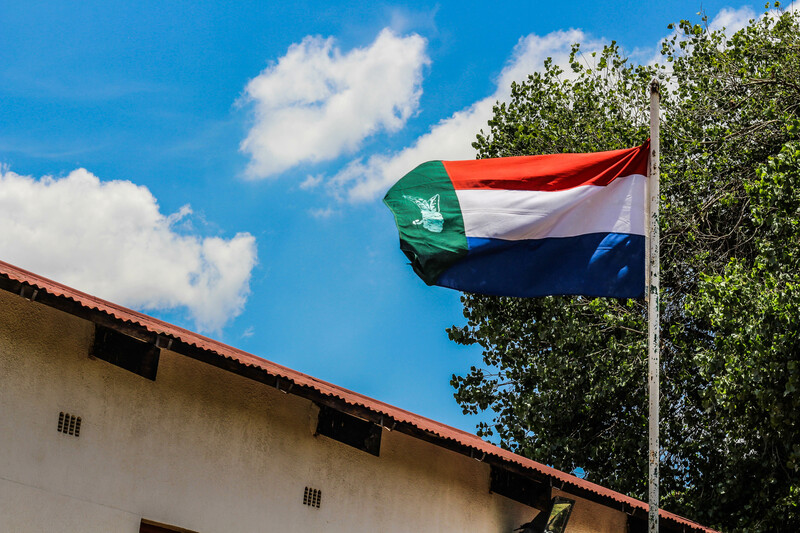 We will be celebrating its heritage in 2020 where we will be flying the flag with the ‘kanniedood’ plant on it,” said one of the elders of the church, Jeanette Smit or ‘Aunt Jeanette’, as she is commonly known. Aunt Jeanette explained that the kanniedood is the Griqua community’s national plant. This is an aloe plant whose Afrikaans name, kanniedood means “cannot die”, which is symbolic of the Griqua people’s historical past. The plant itself is able to survive in harsh conditions due to its succulent properties. It is its ability to survive that became symbolic for the Griqua people, who are a sub community within the greater coloured community of Kliptown, and who refuse to be seen as marginalised. She greeted me with the warmest of smiles as if she had been expecting me. “This is the Griqua church, the only one here in Kliptown,” she said. Aunt Jeanette lives on the property of the church as a caretaker and devout congregant. 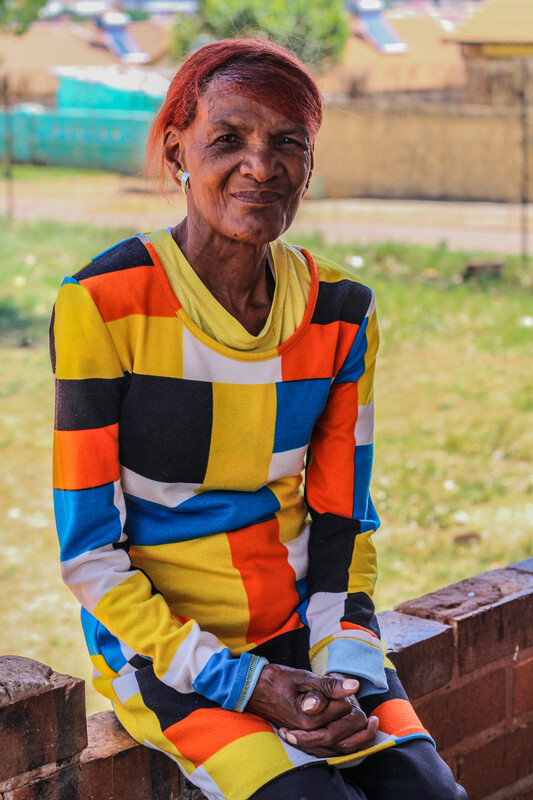 The 72-year-old woman explained that the church served the Griqua community of Kliptown. “The Griqua people are a mix of the Dutch that came to South Africa and the Khoisan who occupied the land in the Cape at that time,” she said. The Dutch first settled in Southern Africa in 1652. To me, Aunt Jeanette looked and sounded no different from any other coloured person. “I am not coloured. I am Griqua, because of my ancestors,” she said. “You find the coloured people here have very mixed backgrounds, and different Christian churches. We only have the Griqua church. Yes I speak Afrikaans like everyone else that lives here, but it is our history that separates us from everyone else, that’s all,” she said. She invited me into her home, whose floors creaked as I followed her inside. The smell was similar to that of a plastic container that had been sitting in a cupboard for too long. She showed me her living room which was small in size but warm and cosy. Right above her over-sized television which took up most of the space in the room, was a framed portrait of an older man with grey hair and wearing a simple brown hat. “That is AAS Le Fleur, the first. He is what we call ‘Die Kneg‘, or the leader of the Griquas. He is the man that brought us [Griqua] all together,” Aunt Jeanette said as she stared at the portrait. Just below it was a calendar, unlike any I had seen before. Written right on the top was “Griqua National Conference Calendar”, which displayed dates of religious holidays and heritage days. “Moederdag – 14 Oktober” it read, meaning they celebrated Mother’s Day just a week before I met her. “We don’t celebrate like everyone else, we have our own special days. On these days, we all dress up in our national colours,” she said excitedly as she sprung up and quickly rushed to her room before finishing her sentence. She brought out a sash that had four coloured stripes – green, white, blue and red. “These are the colours of the Griqua people. Usually the women wear them with a rosette of the kanniedood plant and the men wear ties with these colours,” she said. Andrew Abraham Stockenstrom Le Fleur, the first (AAS Le Fleur I) mobilised the Griqua movement in the Cape in the early 1900s, and was the successor to Adam Kok III, the captain of the Griquas in the Cape in the late 19th century. Pastor David Jansen, senior head of the church, explained that all of the church’s traditions are symbolic of the Griqua people who fought for their identity since the 1800s. “When the church was formed, it was not just a matter of simply going to a church. You look back on the history of what called us. We are a historical church. There will be days where we host functions. From 11 o’ clock to 12 o’ clock I could preach about the gospel, and from 12 o’ clock, someone could come up and just talk and reflect on the history,” said Jansen. Traditions of the Griqua church are different from those of other Christian churches. “We never used to have marriage officers when we married people in the church,” said Jansen. “However, I took it upon myself to get my marriage licence, and now I am the only one in the Griqua church that can marry people. Before it just used to be the reverends that would do it,” he said. Jansen explained that funerals are also different as the church takes much of the responsibility. “When that body moves through those doors right up to the front of the church, then the family has no say over that body, the church then becomes in charge of everything, like when to view for example,” he said. Jansen explained that a reverend or someone with a higher ranking in the church gets a more traditional send off. “The flag would be placed on the coffin and the members would dress in their colours in respect of that member,” he said. Many members of the church grew up in the Griqua community. “I have always belonged to the Griqua community when I grew up,” said Titus De Bruin, a 75-year-old elder of the church who was smartly dressed in a two-piece navy blue suit. The Griqua community in South Africa is led by Alan Le Fleur, the fourth Paramount Chief of the Griqua nation. He is the great grandson of A.A.S Le Fleur I who was known as “Die Kneg”, or “The Leader”, after he received the calling from the Spirit of God in 1889. It was on Mount Manjanie near Matatiele, a mid-sized town in the Eastern Cape that A.A.S Le Fleur I was told to “go gather the dead bones of Adam Kok and call them from the nations so they can be my people and I their God”. “I came to this Griqua church in Kliptown in 1958 when the apartheid government was relocating coloured people that time,” he said. De Bruin grew up in the suburb of Ophirton in the south of Johannesburg, before his family were relocated to Kliptown. Even there, his family attended the Griqua church. “I used to get very emotional when singing our hymns those days,” De Bruin said. “I used to cry when singing, the way [the hymns] were so powerful for me. Don’t look at us now, the way we sing, it was different then”, he said. He explained that their hymns are referred to as ‘die lof’ meaning “praise”. “Die lof is like our people’s cries in history. We even have our own anthem,” he said, adding that it was composed by ‘Die Kneg’ (Le Fleur) as a means of uniting the Griqua people. De Bruin explained that it was the songs of the Griqua choir back then that created this movement. “AAS Le Fleur formed the first choir in the early 1900s and sent out a clarion call with song to unite the people,” De Bruin said. “’Come, oh come, while Christ is calling’, that was the song the choir sang,” he said. Even outsiders admire the hymns of the Griqua people. “Those ladies can sing! They sing so beautifully,” said Gwen Wangra, a local resident and teacher at Kliptown Primary School. “I have only been to that church once, for a funeral, but I know many of the people who attend there. That is just the way Kliptown is, everyone knows everyone. It’s like this big family,” Wangra said. “Kliptown isn’t the same now, but back then, we all looked out for one another no matter where you came from,” she added. 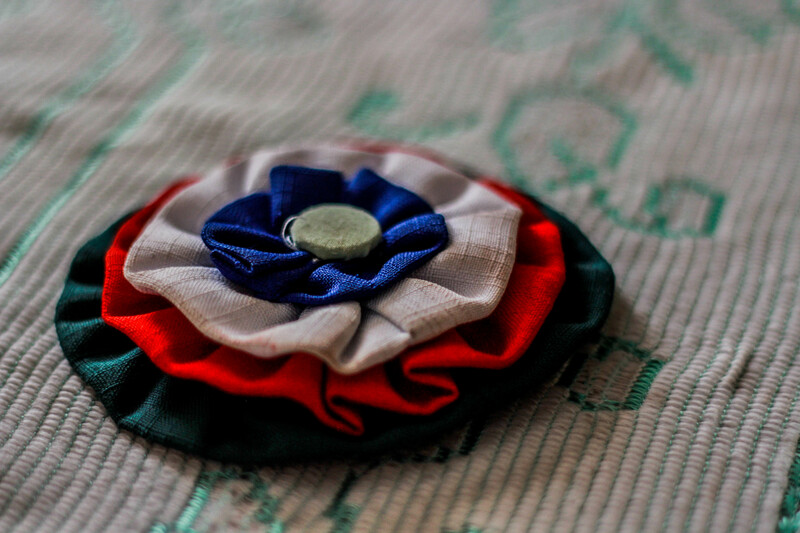 SOVEREIGNTY: The rosette which is worn by women elders of the Griqua church. RESILIENT: The Griqua national flag with the kanniedood emblem, flown during ‘Oumensfees’, a day celebrating the elderly. The church is relatively small in membership as there are about 60 members, according to Jansen. However, on average, only 25 to 30 people attend services on a Sunday, most of whom are 50 and older. “We have a lot of old people because the youngsters have become so modernised now,” said Aunt Jeanette. It is the church’s tradition that women should only enter the church if they are wearing a dress and a hat or scarf to cover their heads. “The young girls today want to wear pants and tops that don’t cover their shoulders. They have their own way of life”, Aunt Jeanette said. WORSHIP: Peter Smit (left) and Sophie Weimers (right) lead the congregation in song. 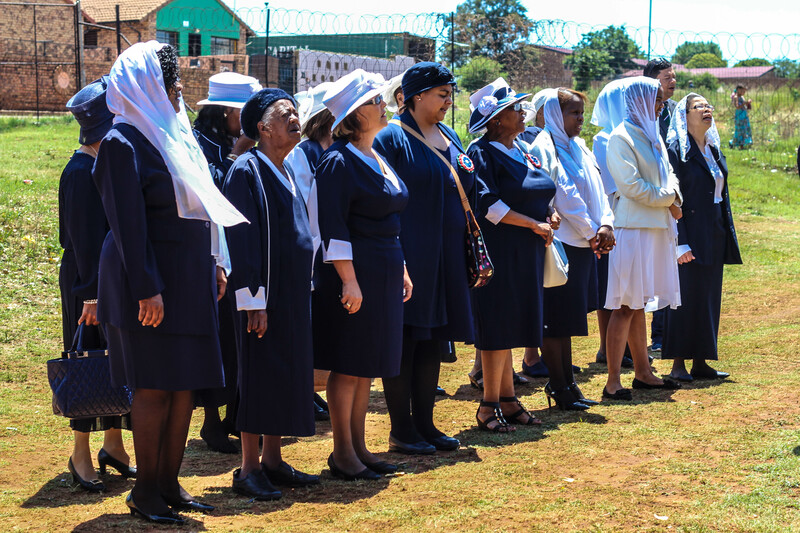 HONOUR: The women of the Griqua church sing as their national flag is raised during the ‘Oumensfees’ service. 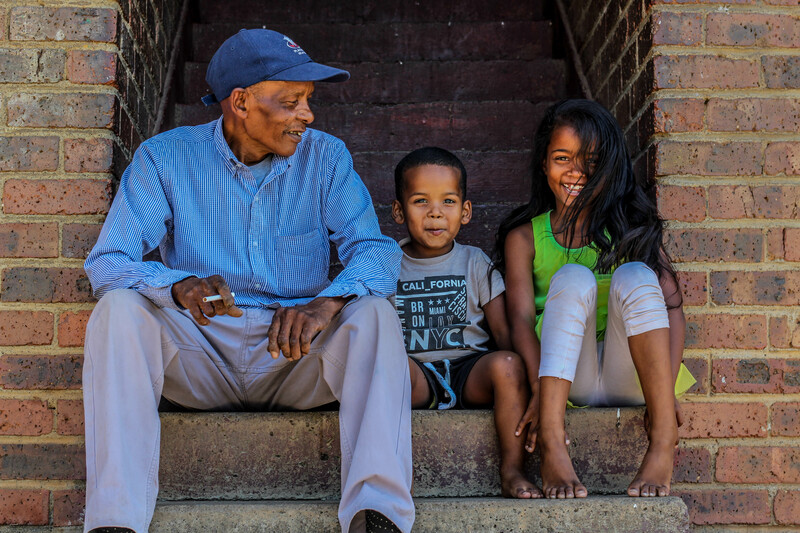 GENERATIONS: Pastor Victor Appels of the Griqua church in Kliptown, sits outside his home in Eldorado Park with his two grandchildren. Aunt Jeanette’s eldest granddaughter, Shameel Usain, also attends the Griqua church, but tends to miss most Sunday services. “Sometimes I go to my husband’s church, which is the ZCC (Zion Christian Church). Other times I am here. I actually prefer this church because it is where I come from,” the 26-year-old said. According to Pastor Jansen, there is a trend where younger people of the church marry out and attend their spouses’ church or just move to another one. “Even my daughter has decided to attend a different church now because of personal preference. It is hard when you cannot keep the legacy on because when the old people are no longer here, who will carry on this history?” Jansen asked. 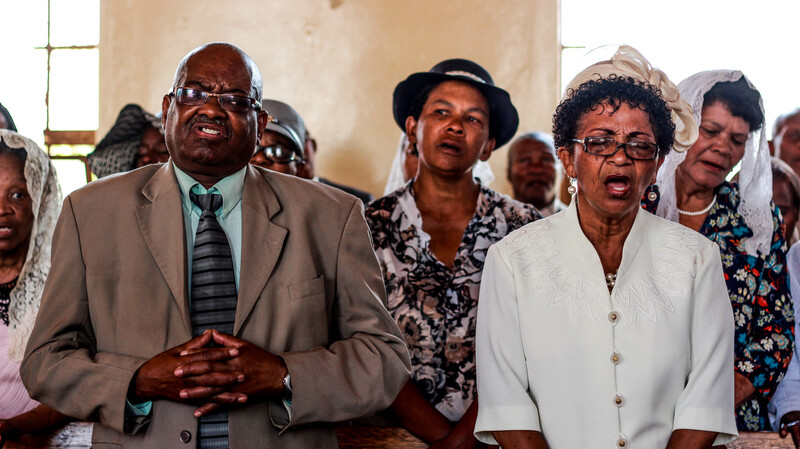 Despite the younger generation of the Griqua community slowly drifting away, they still contribute to moments that are cherished by the congregants. The second service I attended allowed me to witness one of these special moments. As church elder Sophie Weimers stood in the front of the church, she spoke about the strength in song of their people. “Our songs are so rich and so powerful that it even gets the youngest of children singing along,” she said. She proceeded to call on a young boy, around three years old to sing his favourite song for her. “Hallelujah, Hallelujah, Hallelujah! Amen, Amen, Amen!” he sang with his innocent voice. Right on cue, the whole congregation carried the song on and sang. It was this moment that made it clear how important singing is for the Griqua community, not just to carry on the tradition, but also to follow the powerful calling of song almost 100 years later.